Trouble Ahead? Searching For Google's Future : All Tech Considered The ambitious Silicon Valley giant is looking to stay dominant in our technological future. But can it adapt quickly to a changing marketplace? 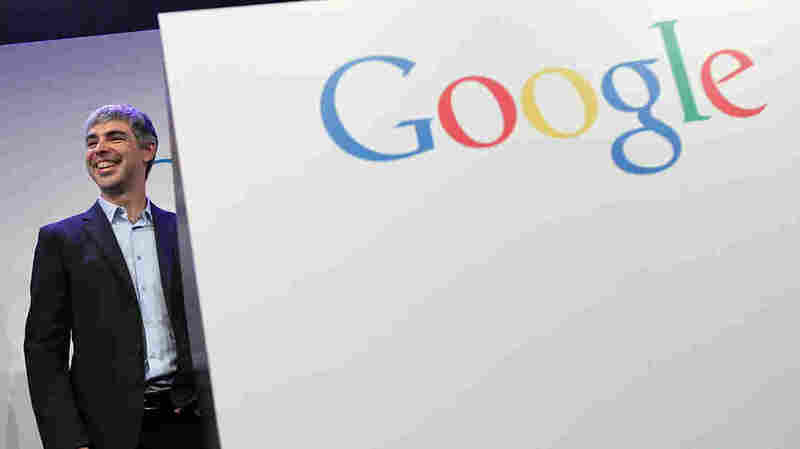 Google co-founder and CEO Larry Page says the company will place more focus on its key projects. It is hard to imagine a world without the ubiquity of Google, and the tech giant is working hard to keep it that way. Google has perfected the art of search advertising on desktop and laptop, and it controls the widely used Android mobile OS, as well as YouTube and Nest. But is the company nimble enough to capitalize on the next best thing in tech? Some tech industry observers aren't sure. Will Google continue to grow or have we reached "Peak Google"? While it is impossible to know the future, there is evidence for both eventualities. 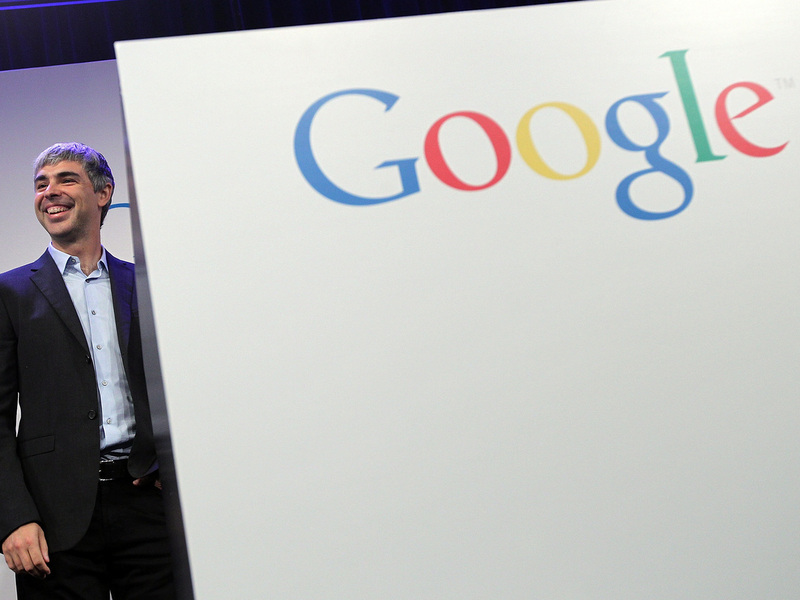 Here, first, are three reasons why Google should be concerned about the future. Trouble mastering mobile. Google has perfected the art of direct-response advertising alongside search results. About 90 percent of the company's revenue comes from this lucrative exercise. However, as smartphones and mobile computing push time spent on desktop and laptop computers to the sidelines, Google has grappled with how to remain an advertising powerhouse. The company has notoriously struggled with mobile advertising, while rival Facebook has seen more success. In a world centered on a fragmented mobile advertising market, Google could suffer. The perils of incessant experimentation. The "throw it up against a wall and see what sticks" method. Good for testing spaghetti, sending out college applications, and ... for technological innovation? Google seems to think so. The company has famously introduced a myriad of now-defunct services — ones that didn't pan out as expected such as Google Wave and, more recently, Google Helpouts. This kind of innovation is bold, and not a bad strategy so long as something does, eventually, stick. Specifically, something profitable. But there are no guarantees, and some draw parallels between Google X, the research lab responsible for Google Glass, driverless cars, etc., and Microsoft Research. In both cases resources have been directed toward lots of flashy ideas that, in many cases, ultimately lack in financial follow-through. Of course, Google CEO Larry Page has famously prescribed that the company will now put "more wood behind fewer arrows," meaning that Google will place more focus on its key projects. Still, those arrows need to be chosen carefully, and investors are worried that an excess of Google's attentions are directed toward ancillary aspects of the company. The ebb and flow of power. The final reason Google may decline is more esoteric, but somehow sensible. As Ben Thompson, tech strategist and blogger, comments: "When a company becomes dominant, its dominance precludes it from dominating the next thing. It's almost like a natural law of business." Essentially, an industry giant lacks the maneuverability of a younger company, perhaps a startup. Money, money, money. Google is hugely wealthy. The company posted $14.4 billion in profits in 2014, up about 12 percent from 2013. While a look behind the numbers unveils a more complicated reality, the fact remains that this kind of income allows Google to invest in innovation, even for a product or service that may not pan out. A high premium placed on innovation. The Google workplace culture is renowned for the concept of "20 percent time." This is the idea that, for 20 percent of the time they spend at work, Google engineers are encouraged to pursue independent passion projects. The results of this ethos can be seen in successful projects such as AdSense and Gmail. The reality of whether this 20 percent is truly integrated, or only possible in addition to an employee's normal schedule, is a topic of contention among current and former workers and the management. However, spending time working on more than day-to-day projects is an important value that sets Google apart. If any company seems likely to buck the "natural law of business" trend mentioned above, it would be a company with these priorities. Smart acquisitions. Google bought Android in 2005 as a way to secure a foothold in the mobile market. In 2006, Google picked up YouTube, the popular online video site. And in 2014, Google acquired Nest, a company that has developed a smart home thermostat and smoke detector. Android is the most widely used operating system in the world; YouTube is a powerful road into the mobile advertising market; and Nest, with Google's expertise, appears to have a lot of potential to lead home automation. This is another benefit of the deep pockets of Google — the ability to buy into a promising market. Google has a lot of strengths, making it hard to imagine that the company has started its decline. Of course, no one is suggesting that Google will cease to be relevant overnight. As Farhad Manjoo writes in The New York Times, "Technology giants often meet their end not with a bang but a whimper, a slow, imperceptible descent into irrelevancy." While Google won't disappear, it might not lead the charge into our technological future either. But following along behind the crowd doesn't sound fulfilling for a company of Google's ambitions. Tajha Chappellet-Lanier is the social media intern at NPR.